Jackie Miller exemplifies “extraordinary.” Simply stated, Jackie is a force of nature. 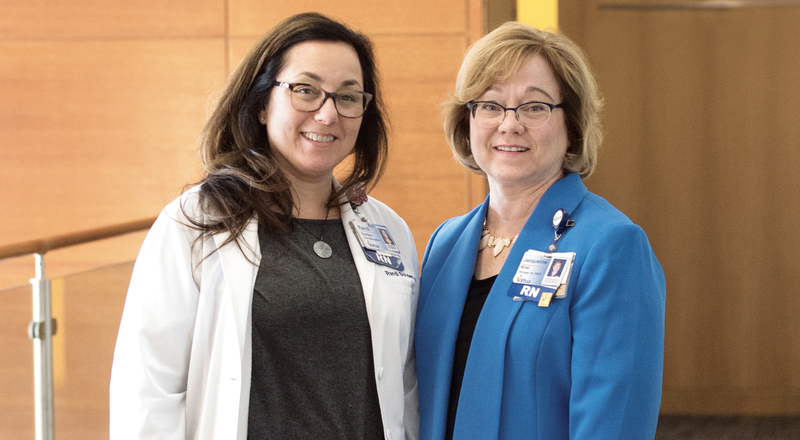 She is a longtime oncology nurse and a role model for not only her team but also the other oncology nurses who have had the privilege of working alongside her. Jackie has a wealth of clinical experience, but what is most impressive about Jackie are the qualities that you won’t find listed on her resume. She is committed and compassionate and always puts the patient first. Currently, as the manager of the region of the New Jersey Cancer Education and Early Detection program based at Virtua, she is responsible for providing cancer screening and outreach to individuals who are uninsured or underinsured. Under Jackie’s leadership, this program that was once failing is now one of the top performers in the state. This is due to the countless hours Jackie has poured into the department and her creativity in reducing barriers to help uninsured patients get the screening they desperately require. Having accomplished such a feat, a person might choose to just continue what they have already completed; not Jackie. She has applied for additional grants and enhanced the program. Recently, she applied for a competitive grant that was awarded by the Burlington Camden County Regional Chronic Disease Coalition for a five-year period. She was also selected to participate in the Together–Equitable-Accessible-Meaningful training at the George Washington Cancer Center for improving health care access to our disparate patient populations. Despite the added responsibilities that will be placed on Jackie, she is looking into other grant opportunities to enhance the services that we can bring to our patients. Bottom line: There is no stopping Jackie, and hard work is not a deterrent to keep her from striving for more. In addition to her full-time commitment, Jackie is the founder and mastermind behind Camp Oasis. Years ago, Jackie had an idea: to create a day of fun for children whose parents were dealing with a cancer diagnosis. This idea took a lot of time and resources to pull together. Initially, Jackie collaborated with her local Oncology Nursing Society chapter to make her vision a reality. She sought sponsors, donations and volunteers to provide a stress-free day for children and a day of rest for parents undergoing treatment. When funding was no longer available, rather than close the camp, Jackie tenaciously pursued other sources of funding so the camp could remain open. Recently, the Virtua Foundation partnered with her to continue serving the children of patients with cancer. Last year, with additional financial support from the community, Jackie was able to plan and execute both a summer and winter edition of Camp Oasis. Despite a tremendous amount of work and time, Jackie has said, she keeps going because she is fueled by the feedback from the parents, the cards and letters, and the joy that campers experience. I would like to share a brief story about how impactful this camp is to those who attend. In 2010, we had twin campers, 10 years old, who came after experiencing the loss of both parents due to cancer. These campers came back year after year and have been so positively affected by their experience that today, as juniors in college, they continue to return to participate as junior counselors. This is the connection that Jackie makes with all her campers and their families. Jackie is already a superstar in our eyes, but this award would publicly demonstrate the years of contributions that she has made to the field of oncology and, more important, to oncology nurses. She is extraordinary and so deserving of this very special recognition.